Pergo Outlast+ Java Scraped Oak's deep chocolate brown color with golden undertones is exquisitely brought to life with an old English character handscrape. The premium detail of cracks and knots add a beautiful juxtaposition of traditional and rustic to a sophisticated design with handsome colorplay. And it is found on an incredibly durable laminate floor. With SurfaceDefense wear protection and the revolutionary new SpillProtect24 technology exclusively from Pergo that defends against household spills for up to 24 hours, your new floor will be worry-free. Pergo Outlast+. Insanely durable, always beautiful. 16.12 sq. ft. per case; 451.36 sq. ft. per pallet. Case quantity: 8 planks; pallet quantity: 28 cases. Case weight: 29.55 lb. Buy online Pergo Outlast+ Java Scraped Oak 10 mm Thick x 6-1/8 in. Wide x 47-1/4 in. 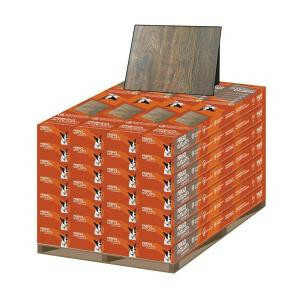 Length Laminate Flooring (451.36 sq. ft. / pallet) LF000844P, leave review and share Your friends.